As another beautiful Oregon summer comes to a close, we can sit back and take pride in our third successful Round Up Relay. Our community raised $77,770.37 towards supporting our programs in the coming year. 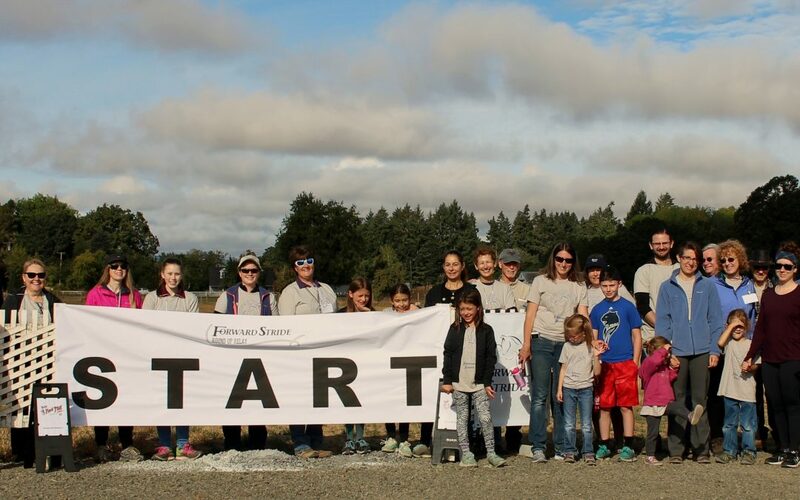 Over 45 people participated, both walking and running around our property on our newly completed trail. We even had some horse participants, who were happy to get out with some of their favorite riders and volunteers. Check our Facebook page to see photos! The Relay was followed by our Open Barn. We served a delicious BBQ lunch and participated in some fun carnival games, including the chance to dunk Forward Stride’s Executive Director, Amber Varner. We had quite a few good throws, and Amber hit the water more times than we could count! Visitors in the afternoon were treated to birthday cake and cookies to celebrate Forward Stride’s 15th birthday, and our Rehabilitation Services, Equine Facilitated Psychotherapy, and Vaulting programs presented demonstrations in our Psychotherapy arena. During all the Round Up Relay and Open Barn fun, Forward Stride also hosted a tack sale in our large covered arena, which raised $4,161. A big thank you to all our volunteers who prepped our donated tack and arranged such a fabulous set-up! Additionally, we are proud to thank all of our Round Up Relay sponsors, including Bob’s Red Mill, Gallops Saddlery, Fraley & Company, Chip Drop, Oregon Vape Shoppe, and Oregon Horse Country. Finally, congratulations to Jessica and Team PDXLAN for raising the most funds toward the Relay, to Team Dee for being the team to walk the most laps, and to Susan for being the individual to walk the most laps. Great job, everybody! We’ll see you next year!